設備租賃股 - 舊討論區 - 巴菲特班 洪瑞泰 (Michael On) - Powered by Discuz! Ryder operates behind the scenes, managing critical fleet, transportation and supply chain functions for over 50,000 customers, many of which make the products that consumers use every day. When you choose Ryder, you get access to industry-leading technology, one of North America’s largest fleet of trucks, an expansive infrastructure of maintenance facilities and warehouses, and some of the most talented people in the industry. Ryder System, Inc., or Ryder, is an American-based provider of transportation and supply chain management products, and is especially known for its fleet of rental trucks. Ryder specializes in fleet management, supply chain management and dedicated contracted carriage. Ryder operates in North America, the United Kingdom and Asia. Ryder System, Inc. is engaged in offering transportation and supply chain management solutions. Supply Chain Solutions (SCS), which provides supply chain solutions, including distribution and transportation services in North America and Asia. Through its FMS business, the Company provides its customers with various fleet solutions. In addition, it provides its customers to purchase a selection of used trucks, tractors and trailers through its used vehicle sales program. Its customer base includes enterprises operating in various industries. United Rentals, Inc. (NYSE: URI) is the largest equipment rental company in North America, with about 11 percent of the region's market share. It owns the largest rental fleet in the world, has a workforce of over 13,500 employees, and operates 968 locations across 49 U.S. states and 10 Canadian provinces. In 2016, United Rentals' revenue totaled more than $5.7 billion, with over $2.6 billion in profit. It is ranked #452 on the Fortune 500. URI was founded in 1997 by Bradley Jacobs and grew primarily through acquisition. It offers general, aerial, and specialty rentals to a customer base that includes construction and industrial companies; utilities; municipalities; and homeowners. In addition to rentals, the company offers new and used equipment sales, servicing, and safety training. 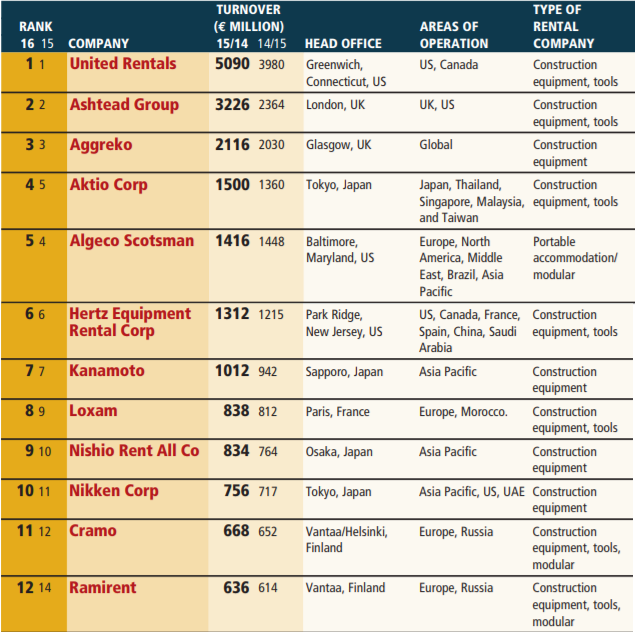 Founded in 1997, United Rentals has become the world’s largest equipment rental provider, with an integrated network of 1,000+ rental locations in 49 states and 10 Canadian provinces, and $11.6 billion OEC of rental fleet including 3,300 classes of equipment. Our diverse customer base includes construction and industrial companies, utilities, municipalities, government agencies and independent contractors. Most of our customers align with three categories: approximately 50% are non-construction, such as industrial; 46% are non-residential construction; and 4% are residential. We provide every customer with access to the best people, equipment and solutions in the industry. United Rentals, Inc. is a holding company. The Company is an equipment rental company, which operates throughout the United States and Canada. It operates through two segments: general rentals, and trench, power and pump. The general rentals segment includes the rental of construction, aerial, industrial and homeowner equipment and related services and activities. The trench, power and pump segment includes the rental of specialty construction products and related services. 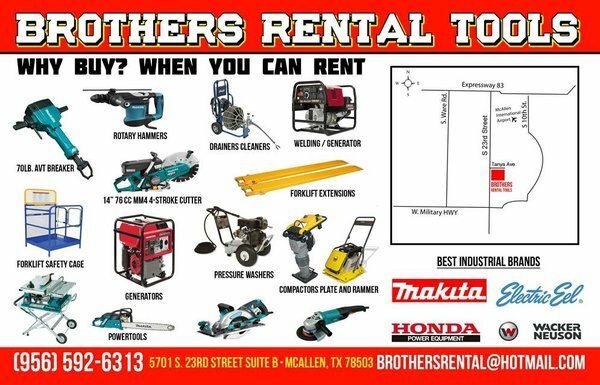 Its general rentals segment includes the rental of general construction and industrial equipment, such as backhoes, skid-steer loaders, forklifts and material handling equipment; aerial work platforms, such as boom lifts and scissor lifts, and general tools and light equipment, such as pressure washers, water pumps and power tools. As of January 1, 2017, it operated 887 rental locations. The Company conducts its operations through its subsidiary, United Rentals (North America), Inc. (URNA) and subsidiaries of URNA. AerCap is the global leader in aircraft leasing and aviation finance. AerCap’s high quality and well diversified portfolio of aircraft, one of the largest in the world, provides a global network of airline customers with comprehensive fleet solutions. AerCap has one of the most attractive order books in the industry with the most modern, fuel-efficient aircraft. The company is funded by a robust long-term capital structure that generates strong profitability and cash flow. AerCap is listed on the New York Stock Exchange (AER) and has its headquarters in Dublin with offices in Amsterdam, Los Angeles, Shannon, Fort Lauderdale, Singapore, Shanghai, Abu Dhabi, Seattle and Toulouse. AerCap (AER) is the world's largest independent aircraft leasing company after acquiring International Lease Finance Corp.
in 2014. As of December 2016[update], AerCap had 1,566 owned, managed or on order aircraft in its portfolio. AerCap serves over 200 customers in approximately 80 countries with comprehensive fleet solutions, and provides part-out and engine leasing services through its subsidiary, AeroTurbine. AerCap is listed on the New York Stock Exchange (AER) and has its headquarters in Dublin with offices in Amsterdam, Los Angeles, Shannon, Fort Lauderdale, Miami, Singapore, Shanghai, Abu Dhabi, Seattle and Toulouse. On December 16, 2013, AerCap agreed to buy International Lease Finance Corporation (ILFC) with value around $5.4 billion, $3 billion is paid by cash and the rest with AerCap common shares newly issued. The deal gives AerCap $43 billion in total assets and a fleet of over 1,300 aircraft compared to GE Capital Aviation Services with a fleet of 1,800+ aircraft. American International Group as the parent of ILFC carried 46 percent shares of the combined company and the rest was held by existing AerCap shareholders. AerCap Holdings N.V. is an independent aircraft leasing company. The Company focuses on acquiring in-demand aircraft, funding them, hedging interest rate risk and using its platform to deploy these assets. It operates its business on a global basis, leasing aircraft to customers in various geographical regions. The Company is engaged in leasing, financing, sales and management of commercial aircraft and engines. It owned 1,022 aircraft, managed 95 aircraft and had approximately 420 new aircraft on order, which included 204 Airbus A320neo Family aircraft, 109 Boeing 737MAX aircraft, 50 Embraer E-Jets E2 aircraft, 38 Boeing 787 aircraft and 19 Airbus A350 aircraft, as of December 31, 2016. 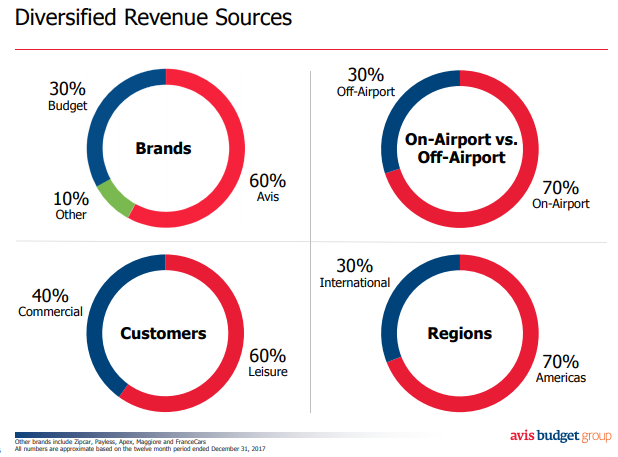 As of December 31, 2016, its owned and managed aircraft were leased to approximately 200 customers in approximately 80 countries. AeroTurbine, Inc. is the subsidiary of the Company. Ashtead is an international equipment rental company with national networks in the US and the UK and a small presence in Canada. We rent a full range of construction and industrial equipment across a wide variety of applications to a diverse customer base. Our equipment can be used to lift, power, generate, move, dig, compact, drill, support, scrub, pump, direct, heat and ventilate - whatever is required. We operate mainly in the US and UK, under the brand names Sunbelt Rentals and A-Plant. Description The second largest equipment rental business in the US, Sunbelt continues to increase its market share rapidly. Sunbelt has 689 locations across the US and in Canada. The largest equipment rental business in the UK with 187 locations nationwide, operating in a mature, stable market. Ashtead Group plc is a British industrial equipment rental company formerly based in Leatherhead, Surrey but which has since moved to new offices in the City of London. It is listed on the London Stock Exchange, and is a constituent of the FTSE 100 Index. Ashtead Group plc is an equipment rental company. 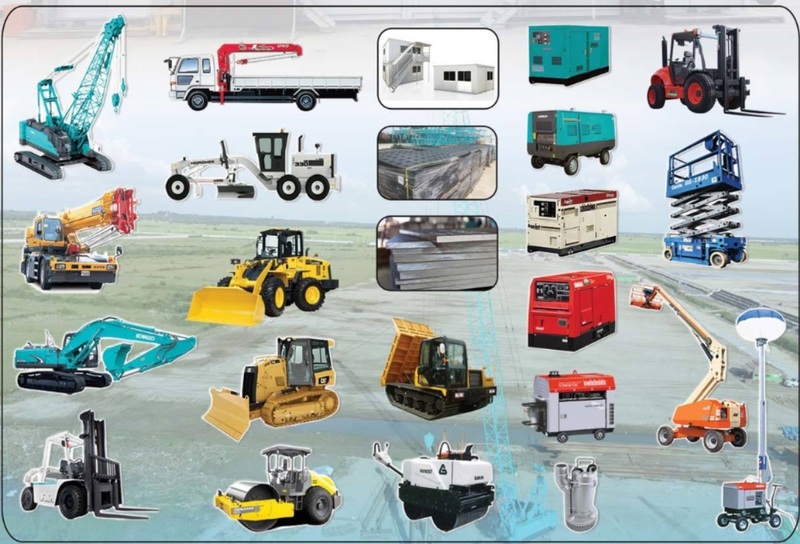 The Company rents a range of construction and industrial equipment across a range of applications to a diverse customer base. The Company's segments include Sunbelt and A-Plant. The Company operates in the United States, the United Kingdom and Canada. The Company operates approximately 550 stores in over 40 states in the United States and over 10 stores in Canada. The Company's equipment can be used to lift, power, generate, light, move, dig, compact, drill, support, access, scrub, pump, direct, heat and ventilate. The Company rents on a short-term basis. It sells old equipment in the second-hand market. The Company's rental fleet ranges from small hand-held tools to a range of construction equipment. It provides rental solutions for non-residential construction markets, facilities management, disaster relief, event management, climate control, scaffolding and traffic management. We're a specialized company in car rentals in Brazil and Latin America. With our 41 years of experience, we'd like to invite you to rethink what mobility means. Localiza is a Brazilian car rental company founded in 1973 in Belo Horizonte and is the biggest car rental in Latin America and one of the largest in the world by size of the fleet and market capitalization. Localiza has a network consisting of 584 car rental branches in Brazil and in other eight countries, 286 of which are owned directly and 158 of which are franchised in Brazil, in 280 cities around the country. being 70 branches are franchised abroad in 44 cities in Argentina, Chile, Colombia, Ecuador, Paraguay and Uruguay. In addition to the rental car company also operates in the business of leasing and fleet management, and grant franchises for the sale of used cars from its fleet to renew the order process, these businesses are complementary and mutually reinforcing. 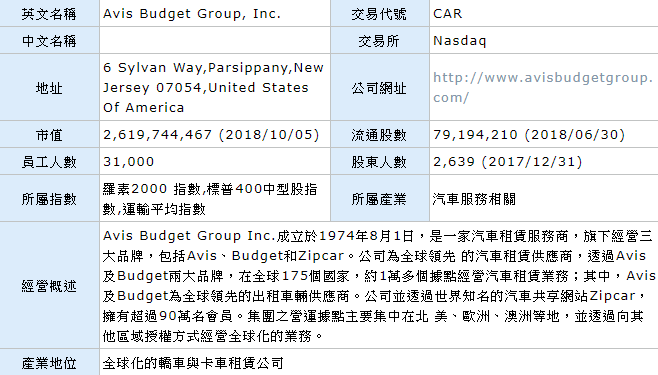 Currently the company has more than 184.000 cars from brands like Volkswagen, Fiat, Renault, Chevrolet and other nine automotive companies. 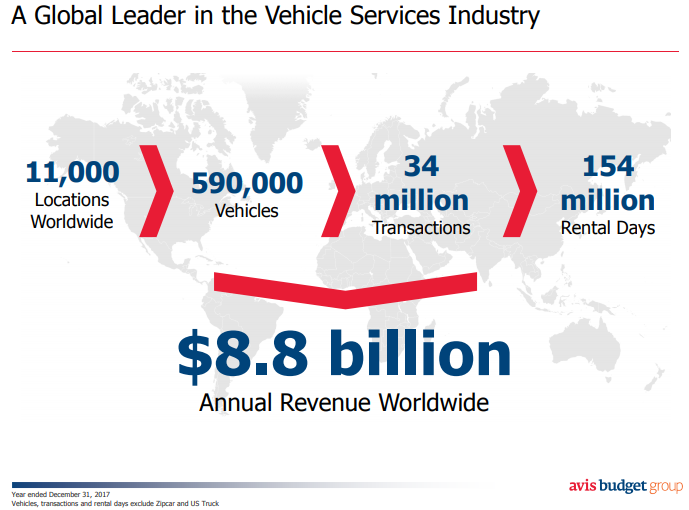 Localiza competes with Movida, Locamerica-Unidas and others car rental companies. Localiza Rent a Car SA (Localiza) is a Brazil-based company primarily involved in the car and fleet rental. Fleet Rental division, which is engaged in rental of fleet vehicles to corporations for long-term periods, and Franchising division, which is active in the administration and granting of franchise rights to use the Company’s brand, including the transfer of knowledge necessary for the operation of the business. Through its subsidiary Prime Prestadora de Servicos SA, the Company is also involved in the intermediation in the sale of cars previously used in its rental operations. As of December 31, 2011, the Company’s network, including domestic and foreign franchisees, comprised 449 branches in 314 cities in Brazil and 47 branches in 27 cities in seven other countries of South America.